"This is the easiest and most delicious chicken teriyaki recipe for those who want a sauce that reminds them of takeout Chinese food, but prefer to cook at home. I served this with homemade vegetable fried rice and potstickers from my grocer's freezer." Heat oil in a large nonstick skillet over medium-high heat, and brown the chicken breasts on both sides, about 6 minutes per side. 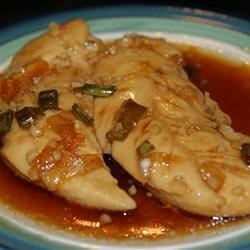 Whisk together the teriyaki sauce, white wine, orange marmalade, garlic, ginger, and green onions in a bowl, and pour the sauce over the chicken. Cover the skillet, reduce heat to low, and simmer until chicken is no longer pink in the middle, turning the chicken in the sauce several times as it cooks, 10 to 15 minutes. Serve hot. This was okay. The flavor was pretty good, but the sauce was too thin (read: watery.) I think I'll add some cornstarch next time to thicken it up. This was really good and easy to make. Adding a teaspoon of corn starch does help. I forgot to add the dry white wine and it was still good. In lieu of Terriyaki sauce I just used a bit of soy sauce to taste. I also added broccoli slaw and sauted. Quick to make but VERY SALTY! Needs cornstarch to thicken it up. Also added brown sugar or it was too salty. Next time I will add red pepper flakes.